Who said summer is over in Chester?! Our writer Paul Crofts heads to Storyhouse to enjoy a cheeky little Summer Holiday complete with a big red London bus. This successful stage version of the hit 1960s film starring Cliff Richard marks the start of Storyhouse’s Autumn/Winter season at Storyhouse, with a week-long run in Chester as part of a nationwide tour. Photos: PR. 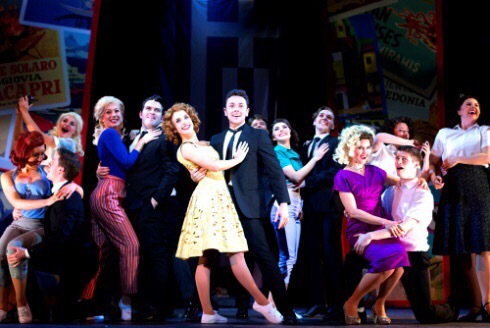 Based on the 1963 film which saw Cliff Richard and the Shadows take off on a joyous jaunt across Europe in a Routemaster bus, this production of the stage show stars musical theatre star Ray Quinn, former X Factor runner up and winner of Dancing on Ice. Quinn takes on Sir Cliff’s famous role as Don who, with his fellow London Transport bus mechanics, journey through Paris, the Alps, Italy and then Greece, along the way picking up a girl group in a clapped-out Morris Minor and a young American pop star on the run from her domineering mother. The hit-filled musical includes classics such as In the Country, Summer Holiday, Travellin’ Light, Bachelor Boy, Move It, Living Doll, The Young Ones and On the Beach. If you love music of the 60s and particularly Cliff Richard and The Shadows, this is one musical not to miss. From the minute the show opens there is 60s hit after 60s hit as the cast embark on a series of energetic song and dance routines interwoven into the show (sometimes tenuously it has to be said). The show is brilliantly choreographed by director Racky Plews who gets the feel of the period bang on. I half expected Lionel Blair to come bounding across the stage to lead the dancers. From the off, the show really does play great homage to the original film and has the feel of one of those black and white TV specials from the 60s which always seemed to feature stars like Cilla, Tarby and not forgetting Cliff himself, except that this show is in glorious technicolour. All credit too must go to musical director Robert Wicks and the live band, sadly hidden from view, who faithfully re-created that particular sound which bands of the era had, great job guys. The plot of the show moves swiftly from scene to scene with the action moving quickly from rainy London to Paris and on to the Alps. There is never a moment where the action flags or feels flat which can happen in some shows. I must admit to being somewhat taken aback on hearing star of the show Ray Quinn affecting an upper class acccent, so used are we to hearing him with his normal scouse voice. Quinn and the ensemble cast make the dance routines look effortless and really do justice to the songs of the era. Stand outs for me were We Say Yeah, Summer Holiday (of course) and Do You Wanna Dance, all performed with such energy from the cast, leaving the audience roaring their approval. It would be wrong to single out members of the cast for special praise as they were all on top of their game but, watch out for William Beckerleg who pops up in various guises, and Wayne Smith as Jerry the much put upon agent/PA of Taryn Suddings, the brilliantly needy and scheming Stella. The set for the show is understandably dominated by the impressive London bus, complete with working headlights and advertising posters of the day. The bus moves back and forth and even revolves to reveal the cutaway interior. It is used to great effect throughout and even comes with a built in shower which is used to great comic effect in one scene, about which I shall say no more so as to not give the game away. Summer Holiday is a much needed dose of sun as the autumnal days draw in, a feelgood celebration of the hits of Cliff Richard and the original film with some stellar performances from the central and supporting cast. My only minor criticism (and I made allowances for it being opening night) was that the sound could have better in the first half but this was soon rectified in the second act and certainly did not detract too much from the overall quality of the production. A medley of some of the hit songs from the show at the curtain call brought the audience to their feet, clapping along and joining in, thus giving the cast a much deserved standing ovation, it was fun to hear people humming the songs as they left the auditorium, always a good sign. Summer Holiday runs at Storyhouse until Saturday 15th September with performances at 2.30pm and 7.30pm. SO very sorry to miss this…sounds fabulous…and loved Paul’s juicy detailed review. Great that Story House caters for a whole spectrum of ages…in everything it’s doing…I’m at the latter end of the spectrum…….saw ” Summer Holiday” in the Odeon when it came out…great Cestrians have enjoyed it all over again!